CO2balance are well known for their carbon reduction projects, in particular the household energy efficient stoves. What’s less well know are the range of additional projects we are involved in within our project communities in Africa. With support from corporate client Toshiba, co2balance commissioned two school kitchens during 2012. These kitchens provide an efficient method for cooking that halves the amount of fuel required to support the school feeding program. This has a huge impact on the school in areas where the school feeding program directly impacts the number of children that can be educated. A reliable hot meal from school is often the only substantial food many of these children get during the day. As many students walk considerable distance to school (4-6KM is not unusual) going home for lunch is not an option. Simple projects that have a lasting effect. For Muhaka Secondary School in southern Kenya providing a hot meal for the students was a real problem. 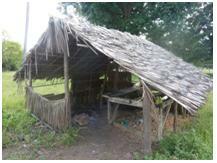 Their existing facility consisted of a palm coved shelter with an open fire. This method of cooking is really inefficient with fuel and the setup is less than healthy for the people working in the kitchen or the food they produce. The school is the first provision in the district for secondary education and with numbers set to grow massively over the next couple of years the existing facility was ill equipped to cope. The local community has done what they can to support the school, funding additional teachers on top of the state allocation, but a new kitchen was well out of reach. With the help of Toshiba, co2balance commissioned the building of the new school kitchen, incorporating three institutional stoves, essentially very large versions of our household project stoves. This purpose built structure has solid walls and floor and secure grills on the windows to keep out pests and vermin,(monkeys are a real problem stealing from the previous kitchen). The stoves have efficient chimneys that draw the smoke outside and there is a good deal of light and fresh air, making the kitchen a healthier place to work. Next to the kitchen area is a secure store where maize and beans, the mainstay of Kenyan school cooking, can be stored safe and dry, reducing wastage and spoil from damp sacks and poor storage from before. The reduction in fuel required will save school budgets and reduce the need for pupils to collect wood on their way to school. The school has also started a tree planting scheme within their grounds that in the tropical climate of the area, should be ready to support at least some of their requirements for wood fuel in just a few years. With the new stoves in place the kitchen is set to be able to serve the needs of the school role as it reaches its peak of 900 pupils in the next two years. This is one example of many community projects CO2balance are involved with. We concentrate our efforts on projects that can assist communities to help themselves out of poverty. We are always looking for further corporate support to help us achieve our aims of providing more support for our host communities. If you would like to know more about our work or how you can get involved please contact us, we would be very happy to hear from you.